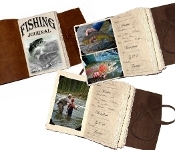 The Leather Fishing Hunting Journal makes the perfect gift for the avid fisherman. 100% hand crafted with top quality leather. The hand stitched spine is not only rustic looking, but it is practically indestructible. Capture your outdoor experiences within the pages of your own Fishing Journal, and relive them again and again. Whether for yourself or for a friend, the Fishing Journal makes the perfect addition to any fisherman's gear.